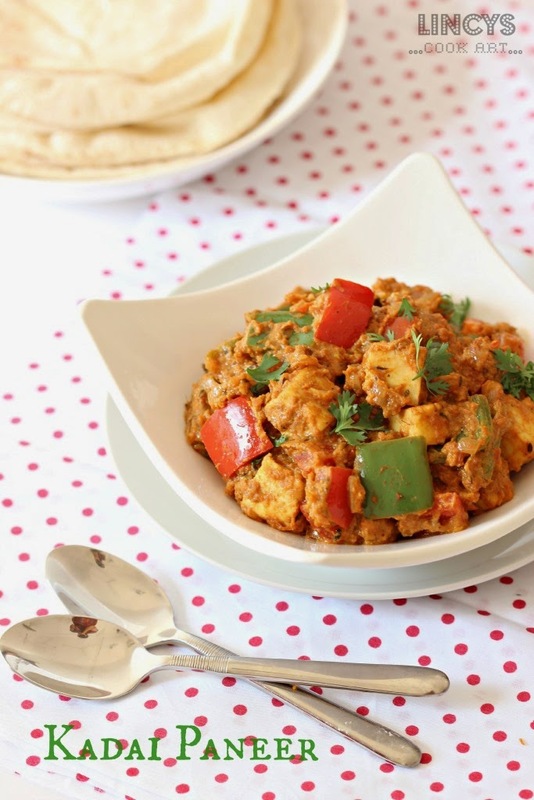 Kadai Paneer is an easy to make tasty side dish for rotis and parathas. I have shared earlier Kadai Mushroom recipe. Kadai dish perfectly suits for the people those who love Indian cuisine. Easy to prepare dish for the guests or even for day today life. Creamy dish flavoured with Kasuri Methi. A perfect treat for the paneer lovers and also vegetarians. By adjusting the cream or yogurt added in this recipe you can make it as a spicy or less spicy dish. Try this colourful dish and make your family members happy. Grind cut tomato inside a blender jar and make as a fine puree and add with it and cook for two minutes. Heat oil in a pan and add jeera and fry till nice aroma arises. Now add the chopped onion and cook till soft and add the ginger garlic paste and cook till raw smell leaves. Add turmeric powder, chilli powder, coriander powder and garam masala powder. Mix well and cook the gravy till the raw masala smell leaves. Simultaneously heat ghee in a pan add the cut capsicum and roast till white blisters starts to appear. Now add the cubed paneer and a pinch of salt and roast with capsicum for a minute then add the paneer cubes and cook together for fifteen to thirty seconds. Add the roasted paneer and capsicum and allow the gravy to boil for a minute. Add salt if needed. Sprinkle Kasuri methi on top of the gravy for flavour. Now add the fresh cream or thick yogurt(beaten) and mix well and immediately switch off the gas. Add chopped corainder leaves for garnishing. After adding cream or yogurt donot cook the gravy else it split and spoil the whole curry. Note: You can use different colour capsicum for this recipe. Use beaten thick yogurt(less sour) without much water content. Loved this rich and delicious paneer subzi . Kadai paneer is my favorite of all paneer curries, love your version..